Four weeks ago I received an email about visiting Copenhagen to try a beer made with 133-year-old yeast at Carlsberg brewery (and on their dime). Two weeks ago I actually had travel plans, and a week ago I got on a plane for Denmark. All of which is to say I didn't have a huge amount of time to prepare for the trip. (One of my first surprises was learning Denmark's not on the euro.) My knowledge of Danish beer extended as far as Carlsberg and Mikkeller, and in the two weeks of preparation, I developed the tiniest of inklings that there was something called "New Nordic" out there. Could it apply to beer? brewing I discovered in Denmark. And indeed, the notion has been extended to beer. Elements of New Nordic beer seem to revolve around the presence of local ingredients, the absence of hops, and something to do with local yeast. It's an odd way to invent a tradition--coming up with the concept first, and then hoping something tasty and commercially successful might emerge from it. This is not typically how beer styles are born, and put me down as a doubter that it will work in Denmark, either. I managed to get to a couple of good beer bars and two Mikkeller outposts, and in the 120+ taps I saw, only one could be called New Nordic. It was a beer made my inoculation with hay (possibly the one Martyn described in the link at the top of this paragraph). It was funky, tart, hazy, headless, and flat--a nice beer, but strange. Beer and cuisine are in many ways similar--they are constructed by people. They reflect culture, history, and place. When talking about this similarity, I often point out how France and Germany have extremely similar climates and agricultural products--but wildly different cuisines. Much like German and French (or better still, Belgian) beers differ wildly. But they are dissimilar in other ways. Beer is a lubricant as much as a consumable. We drink it in part for the flavor, but at least as much for the effect. Beers that are weird, strongly-flavored, and demanding only rarely become pub faves, and even more rarely in the modern era. We like beers that we can enjoy but which don't interrupt the conversation. Hay beer seems at best a longshot to displace Carlsberg. Or, it turns out, the other beers that seem to be rising in popularity. As a category I would say they had a distinctly ... American quality. At none of the places I visited (Fermentorum, Taphouse, Warpigs, or Mikkeller) did I find a taplist that would have looked even slightly unusual to the American eye. IPAs were very popular, as were various tart ales and saisons. Even when the beer style in question was nominally European--a gose, for example, it was invariably prepared in the American fashion, with limes and mint or something un-German. In fact, you'd be much more likely to find a straight up weizen or helles in Portland than the four pubs I visited. My own sense of cognitive dissonance started at Warpigs, the joint project of Mikkeller and Three Floyds. It is self-consciously modeled after an American craft brewery. They brought in Kyle Wolak from Indiana to run the brewery. They installed a Texas barbecuer. And they brew lots and lots of very modern, super juicy IPAs (plus a few familiar favorites like Zombie Dust and Alpha King). When we got the tour, our guide Jacob Alsing told us that they "wanted to bring an American brewery to Denmark." I was prepared to chalk that up as a one-off, but going to the 61-handle Taphouse had the effect of confirming rather than dispelling the sense. Even asking for a "characteristically Danish" beer left the bartender scratching his head. He pointed to local breweries, but couldn't find another beer that had a Danish streak. 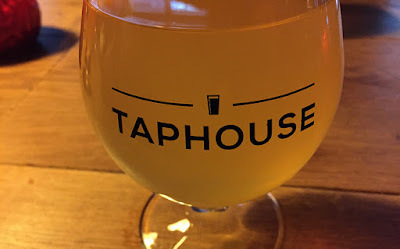 Finally, at Fermentoren on my last full day (beer list here), I had a nice kettle-soured tart made with vanilla and just accepted that the mood of the moment is American. Maybe this is not surprising. Danish craft brewing isn't much older than a decade, and if you were to time travel back to 1990, you wouldn't find too many beers in America that seemed American. We did have beers like Sierra Nevada Pale, though, and these suggested a future in which our vivid IPAs would be so impressive they would be brewed by Americans in Copenhagen. Which, come to think of it, may argue for the hay beer after all. Let's check back in twenty years and see if the New Nordic has become old hat--and hay beers are the wave of the present. Thanks for the post. So many good beer places in Copenhagen! I think that in the Nordics they seem to have embraced the American way (of IPAs in particular) quite a lot. But you *did* have a beer that was characteristically Danish... you had Carlsberg.